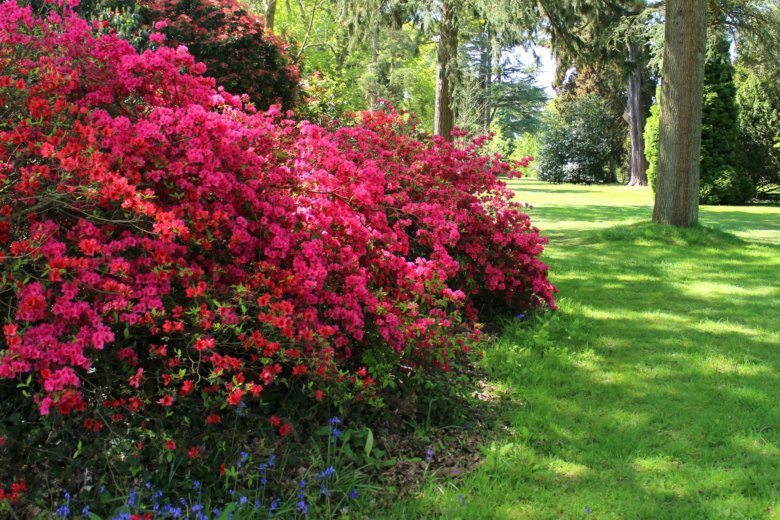 Concerned about your azaleas? Trying to show some love to your cool-season lawn? WTOP garden editor Mike McGrath has answers to your spring gardening questions. I’ll give two garden talks (at 1 p.m. and 3 p.m.) at the Reston Town Center Garden Event on Sunday, May 5. Give these azaleas a chance at an Encore! That’s always the gardener’s prerogative, Paula. But, you say they look good — and that’s the key sign of plant health. And three seasons wouldn’t be unusual for them to need to get comfortable in their site. So, if they were mine, I would spread a cup of Holly-Tone around each bush (to acidify the soil and feed the plants without chemicals); cover that with an inch of milled peat moss (to make sure the soil is acidic; azaleas need acid soil); and then cover the peat moss with an inch of compost (to provide organic matter and activate the peat). Don’t worry about them potentially not performing right now. Because Encores are bred to bloom multiple times a season, there’s a good chance you’ll get flowers in the summer and fall … unless they’re near a chemically-treated lawn or have been fed a high-nitrogen fertilizer. Then the blooms are being canceled out in favor of rapid plant growth. Richard in Culpeper County writes: “Last fall, I bought a plug aerator, aerated my lawn and seeded it. It looked like grass was coming up in the plug holes — and then winter came. Now I see a lot of bare spots and dirt where grass used to be. Did the winter rains wash my seed away? Winter rains should not have harmed any existing grass, Rich. But, if you seeded late in the season, yes — all that rain could have washed the seed away before it could root. The big take-away here is that you should never aerate a cool-season grass in the spring. If you have a warm season turf, such as Bermuda or zoysia, go ahead and aerate and replant. This is the time to work on those grasses. But, if your lawn is bluegrass or fescue, yes, you should wait. Only by about eight months, Mike! Now, this is assuming that you have a cool-season grass such as fescue or bluegrass. If that’s the case, aerating in spring could cause tremendous damage. Cool-season grasses should only be aerated in late summer or early fall. The reason? Pulling little plugs out of the soil lessens compaction and improves drainage but also causes a bit of stress. If that stress is followed by summer heat, cool-season lawns can suffer greatly. In the late summer/early fall, the aeration is followed by the kind of weather that helps cool-season lawns thrive and the stress is minimal. But, again, if you have a warm-season grass such as Bermuda or zoysia, the time to aerate is in the spring — right after the lawn greens back up. I’ve been getting lots of questions about lawns, all of which ask about sowing fresh seed. The time to seed a cool-season lawn such as fescue or bluegrass is late summer/early fall — roughly between Aug. 15 and Sept. 15. The soil is the perfect temperature for speedy germination, and the young grass will thrive in the shorter days and cooler nights to come. Conversely, germination can be slow and spotty in the cool soils of spring — and then summer heat typically burns up the young grass. But, if you want to roll the dice (and especially if there’s no grass at all in some spots), spread a high-quality compost like Maryland’s LeafGro, sow the seed into the compost, cover with a tiny bit more compost and water it gently for about 20 minutes every morning until the new grass is up. Be sure to use matching seed just in case it survives the summer, which is possible if we have a long run of springlike weather. Oh — and you can lay sod now; in fact, you get the best quality and results from sod that’s laid in the spring …. The Lehigh Compost Bin — a 4-cubic-foot system of alternating cedar slats and openings codesigned by J.I. Rodale and engineering professors at Lehigh University — is ideal for growing potatoes. You fill the bottom half with soil, place seed potatoes facing outward at the next level of openings, add more soil and place another set of four potatoes at a higher level of openings, then top off the soil and plant a final run of spuds closer to the center. The potato greenery will grow out of the side openings and up top, providing you with an impressive number of potatoes when you break it all down at the end of the season. As you begin the process, you have to expect some spillage out the slats. Just keep shoveling the soil back on top and the problem will resolve once the potatoes get growing. Mike McGrath was editor-in-chief of ORGANIC GARDENING magazine from 1990 through 1997. He has been the host of the nationally syndicated public radio show “You Bet Your Garden” since 1998 and WTOP Garden Editor since 1999. Send him your garden or pest control questions at MikeMcG@PTD.net.